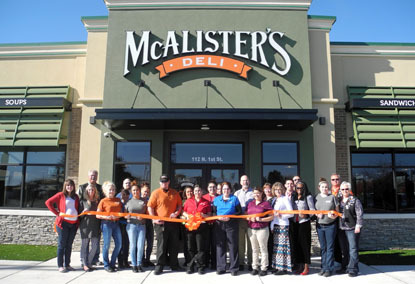 Members of the Artesia Trailblazers, Chamber of Commerce, and staff of McAlister ’s Deli celebrate the grand opening of the new restaurant Friday morning with a ribbon cutting. The new eatery is located at 112 N. First St. and officially opens today. Pictured from left are Kelcey McCaleb, Debbie Edwards, Perry Troublefield, Danielle Pedroza, Ericka Estrella, Blade Ward, Mya Mclaughlin, Rosa Munoz, Colton Eskeli, Maryann Woods, Leyla Mcfadden, Brooklyn Ortiz, David Perez, Pam Teer, Mike Davis, Amanda Flores, Vickie Grousnick, Sondie Stockton, Sam Hagelstein, Zac Gomez, Clara Mauritsen, Devan Crouch, David Grousnick and Susie McCaw.